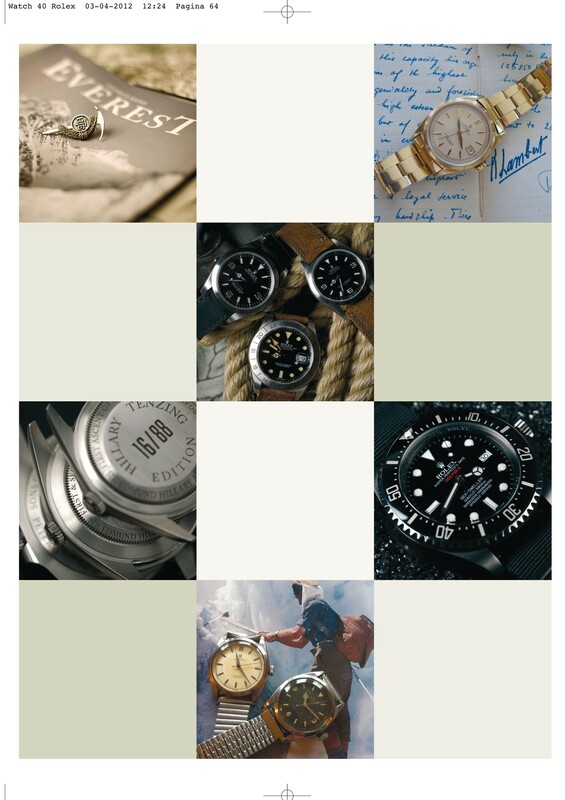 Since my childhood, I became fascinated with watches, and this attraction has grown stronger over the years. 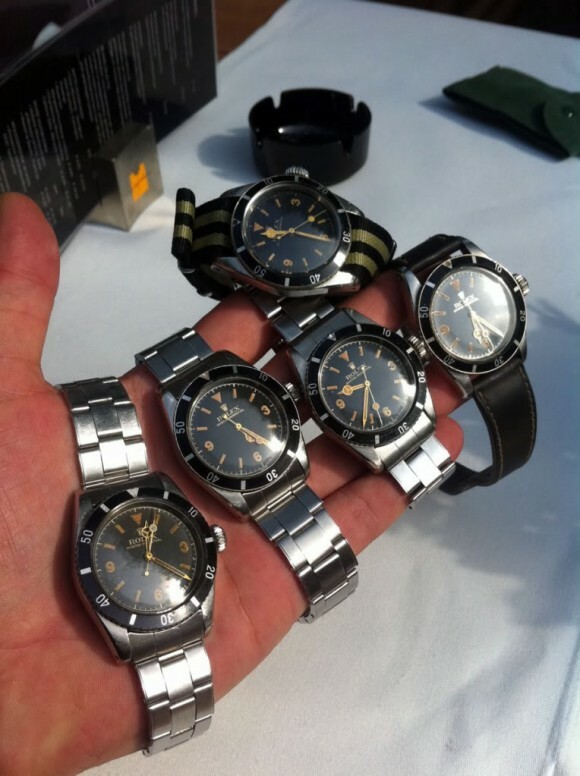 Nowadays, I’m non-stop busy with mostly vintage watches, even in my dreams. It actually feels like I am living my dream. 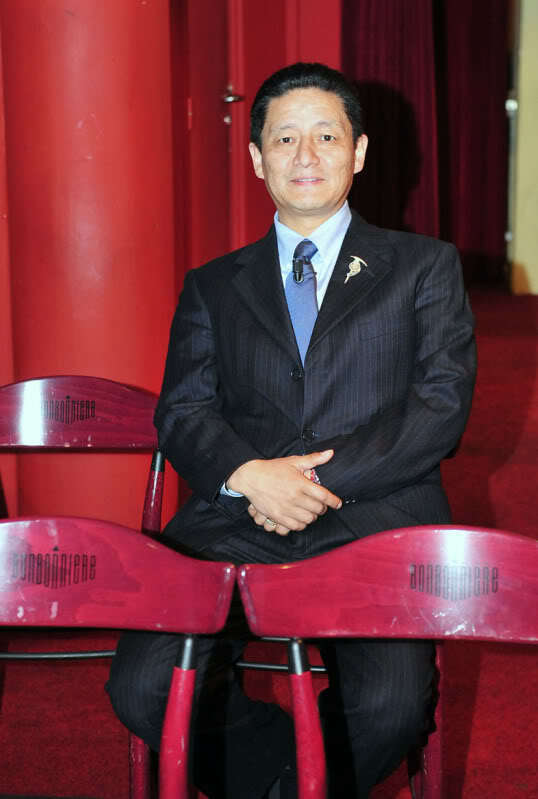 There is even a psychological term for it: harmonic passion. Friends would like to call it more an obsession. 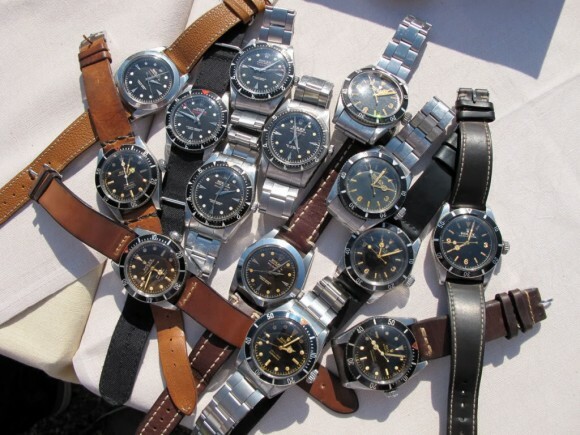 What has triggered this passion for watches and where has it taken me over the years? 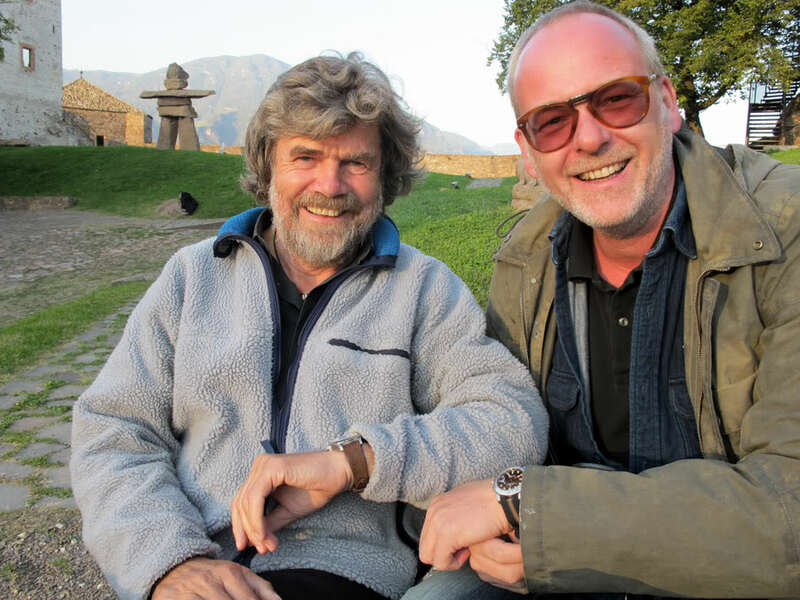 Together with Legendary Rolex Explorer II – Ultimate climber, Reinhold Messner (http://www.reinhold-messner.de/ ) at his Museum MMM ( http://www.messner-mountain-museum.it/ ) in Bolzen, Italia. My first encounter with jewels and watches was at my aunt’s jewelery business in Duesseldorf, at the age of 12. 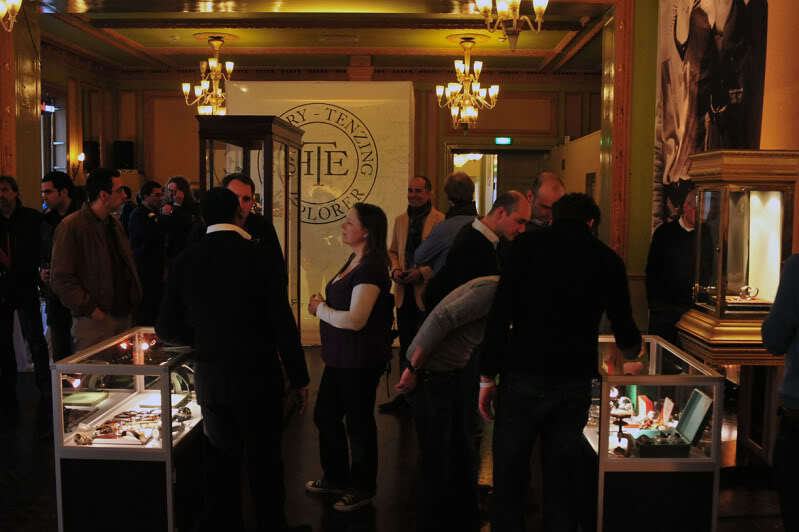 I spent hours in the dazzling exposition rooms of the family business, intrigued by the sparkling gems and beautiful wrist watches. My aunt was equally impressed by the fact that a young boy was so interested in precious stones and watches instead of chasing young girls. I was promised a flourishing career in her jewelery trade, but unfortunately she died soon after. After high school, I returned to my roots in the Dutch province of Limburg, where I became friends with Paolo Steiner. 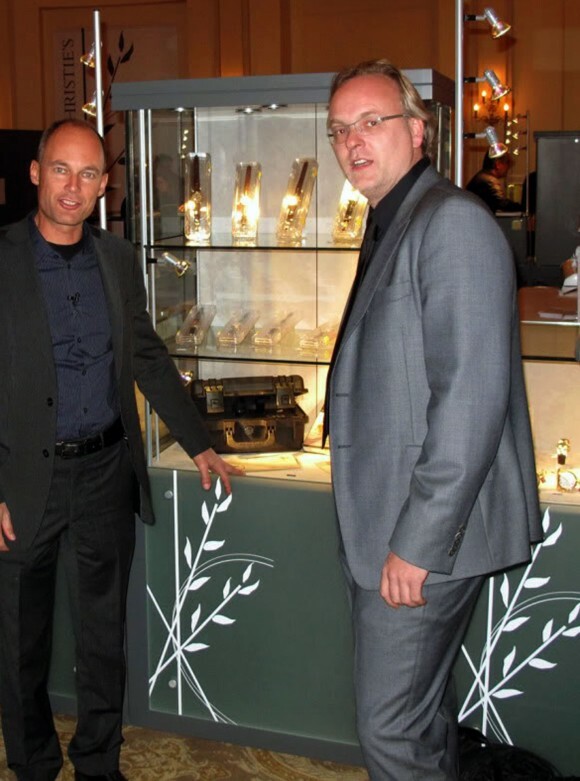 This eager, self-made Swiss jeweler wanted to start a jewelery shop in Maastricht, and in 1986 we opened a business in the charismatic Stokstraat. 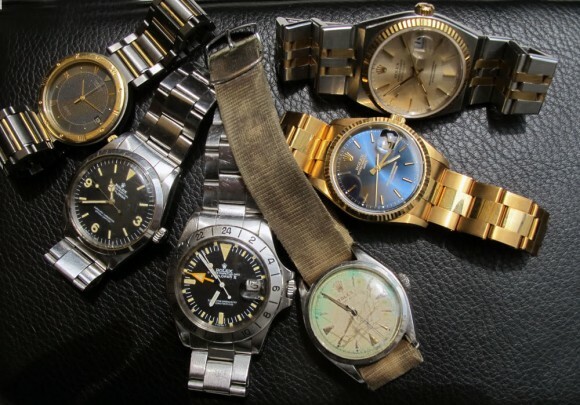 We mostly traded jewels, silver and gold, as a proper watch market was non-existing at the time. 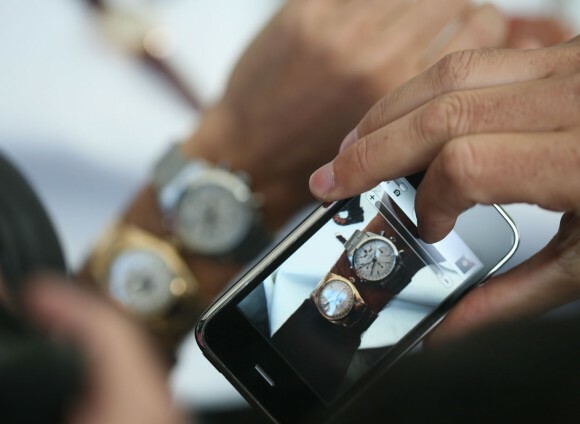 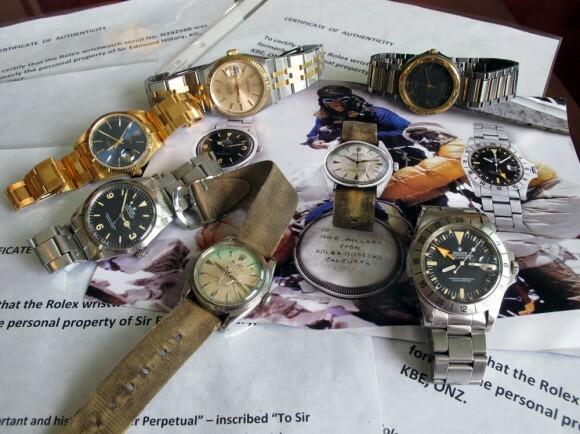 Once in a while, Patek Philippe, Rolex or Omega watches would be offered by customers. 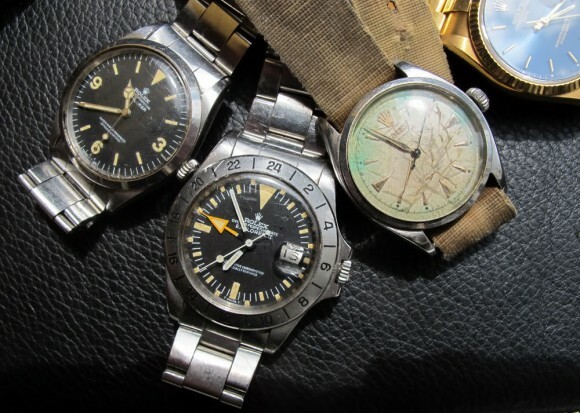 Stunning pieces often, but we knew too little about them to value them properly. In my quest for knowledge I read every book I came across on wrist watches and I spent lots of time on auctions and trade shows, talking to collectors. 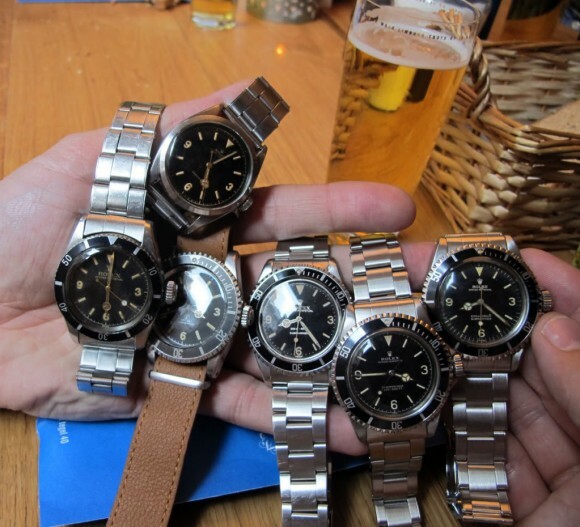 I studied all brands, but soon developed a clear preference for Rolex. Not just lured by celebrities who wore these cool sports watches, like Paul Newman, but mostly by Rolex’s combination of beauty and technical innovation. Rolex played an essential part in expeditions to all corners of the world. 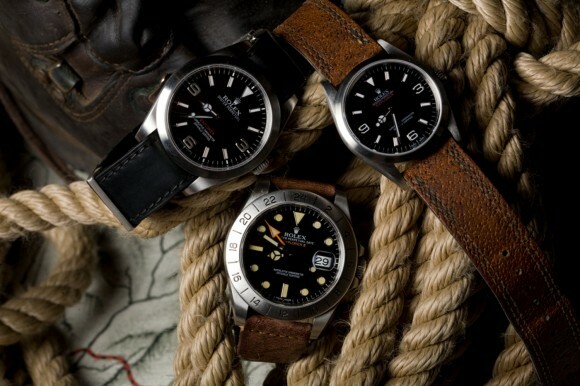 New models and technical inventions were tested under extreme conditions in the planet’s most remote areas. 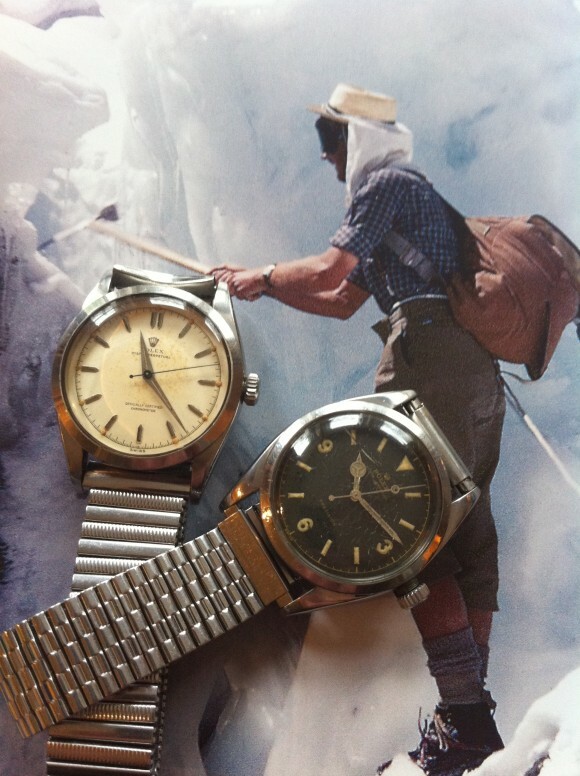 The Rolex tool watch evolution began in the 50’s, when they participated in the expeditions to the highest and lowest point on earth. 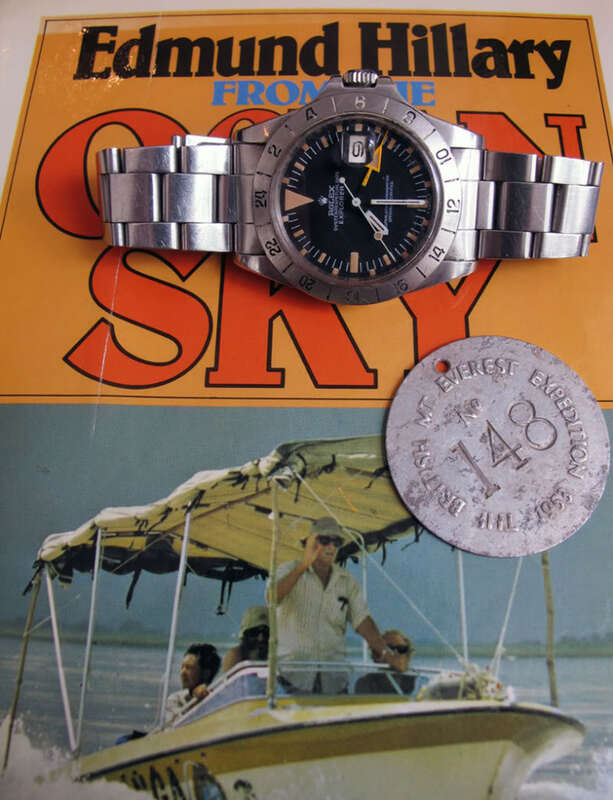 Their marketing campaign “From top to bottom” was inspired by the 1953 summit of Mount Everest, the world’s highest mountain, and the dive to the deepest point in sea, the Mariana Trench in the Pacific in 1960. 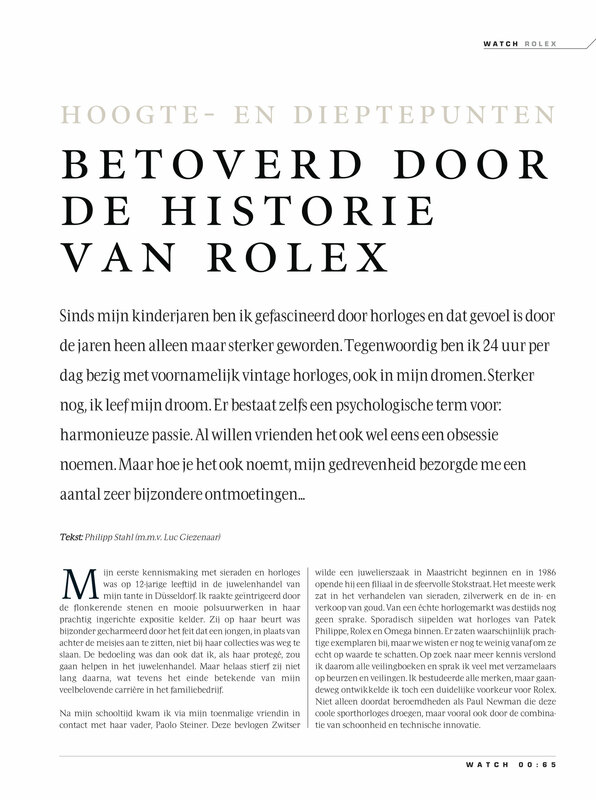 Two crucial highlights in the history of Rolex, which they never used adequately to honor their imposing heritage. Being the Rolex fanatic that I am, I decided to do the exploring milestones proper justice myself, and contacted the sons of these adventurers. 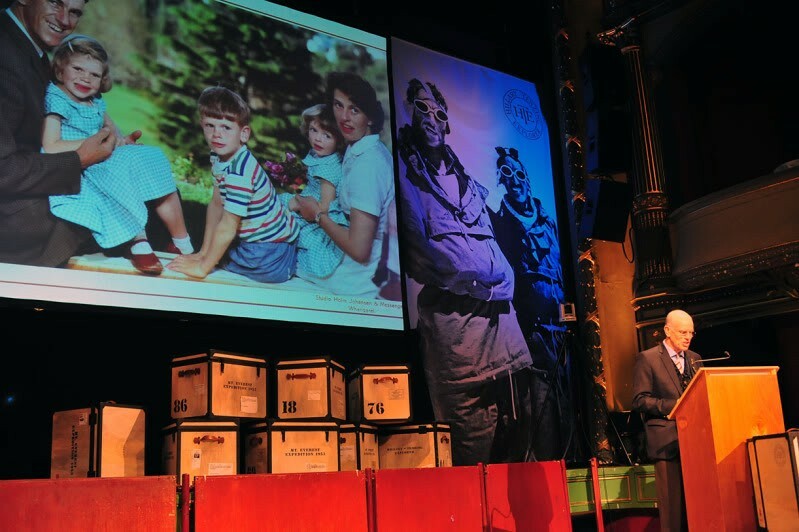 Bernard Piccard, son of captain Jacques Piccard who steered the Bathyscaph Trieste in 1960, was blown away by my idea to honor his dad and immediately wanted to participate. In 2008, we launched a special limited edition, the Single Red Deep Sea. 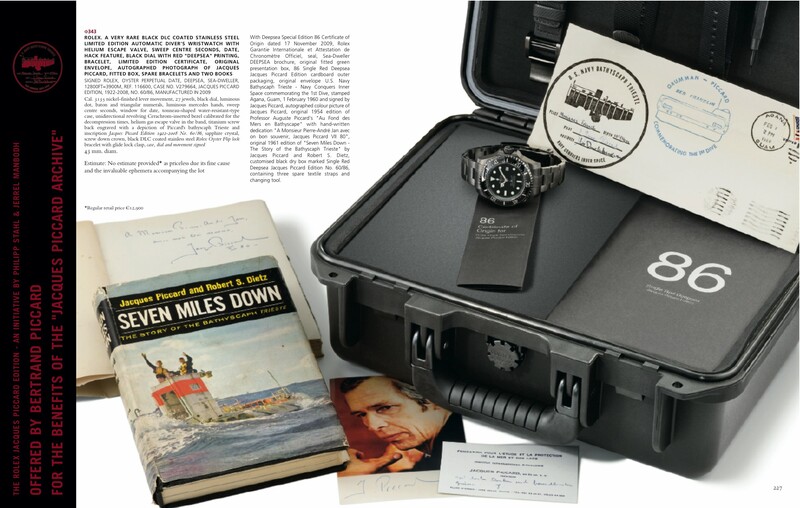 This was a Sea-Dweller Deep Sea, based upon the Deepsea Special that Jacques Piccard took on his dive to the ocean depths. 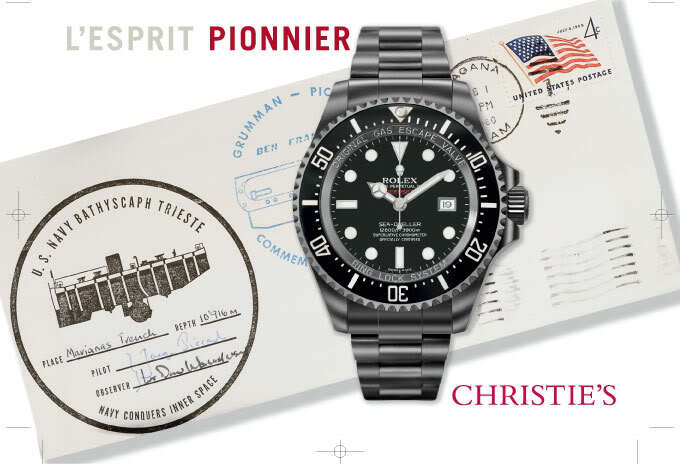 His father had died shortly before the launch at the age of 86, and Bertrand’s lecture prior to the auction for the Piccard Foundation of the last Single Red Deep Sea at Christie’s Geneva, turned out to be an unforgettable event. Here stood a man who had endeavored on numerous life threatening expeditions, but could only mourn for the loss of his beloved father though our tribute project. 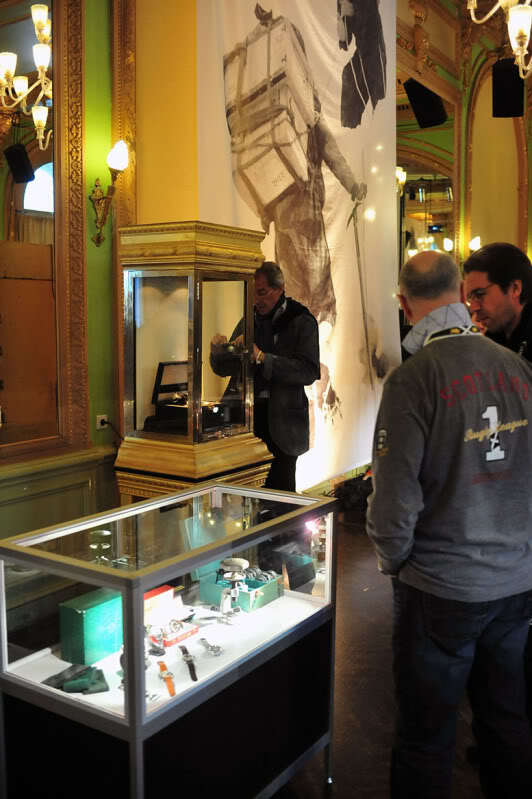 Since then, no visit to Switzerland is complete without stopping by Bertrand’s place. 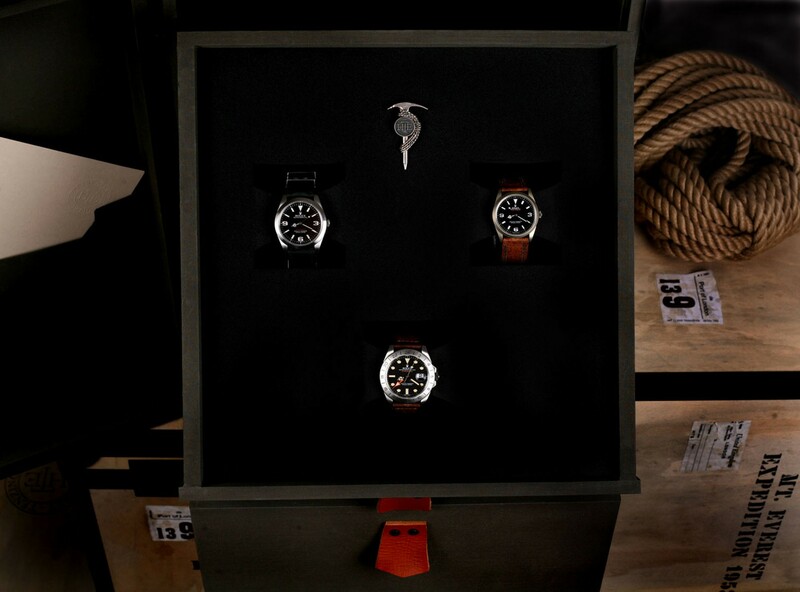 All 86 Single Red Deep Sea packages were sold out immediately, and have become true Rolex collector’s items. 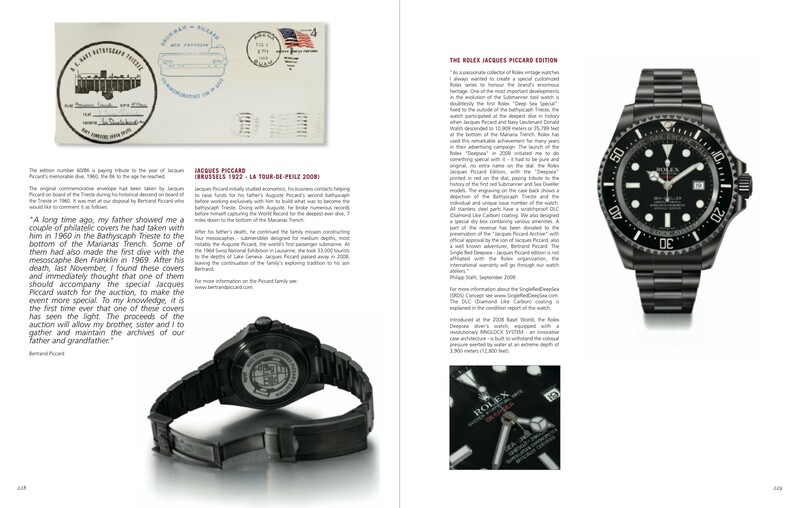 Next is the legendary Lt. Don Walsh I met last year in Geneva. Together with my Piccard DeepSea and his green Submariner, given with ‘appreciation’ by Rolex. 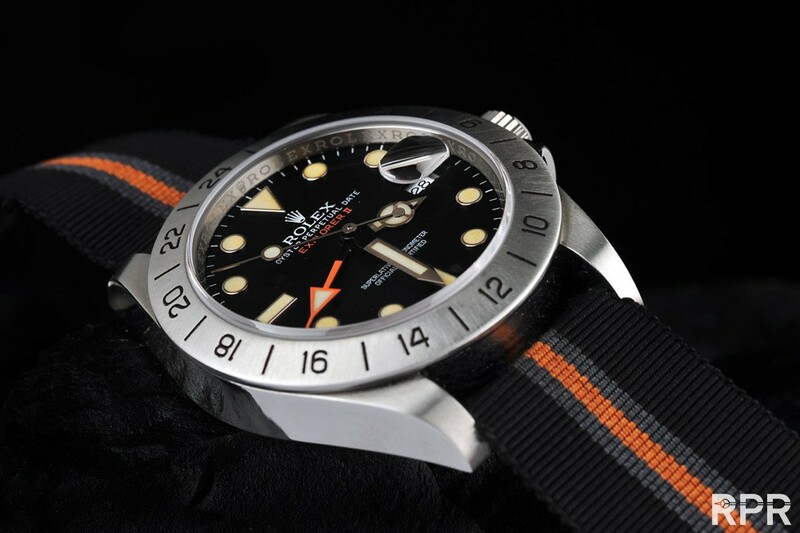 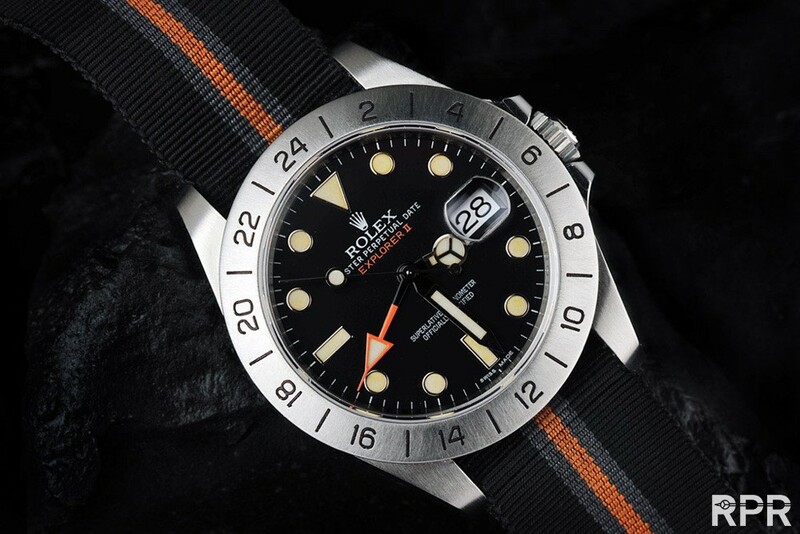 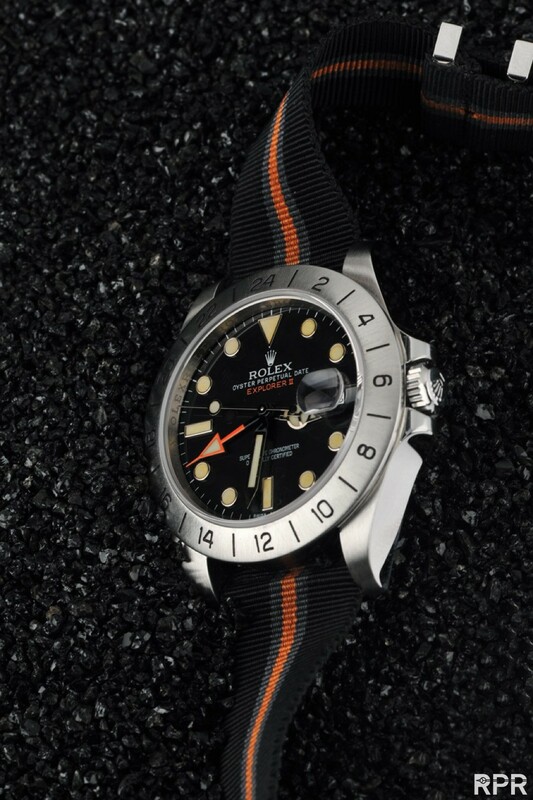 Rolex DeepSea Special, display version from after the 1960 historical dive by Piccard & Walsh.. 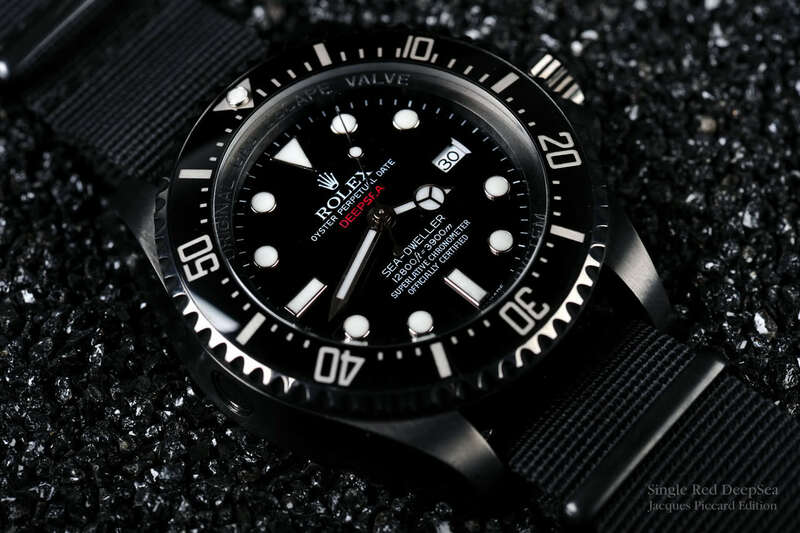 The Rolex DeepSea – Piccard Edition… Limited to 86 only to honor the age of Jacques Piccard. 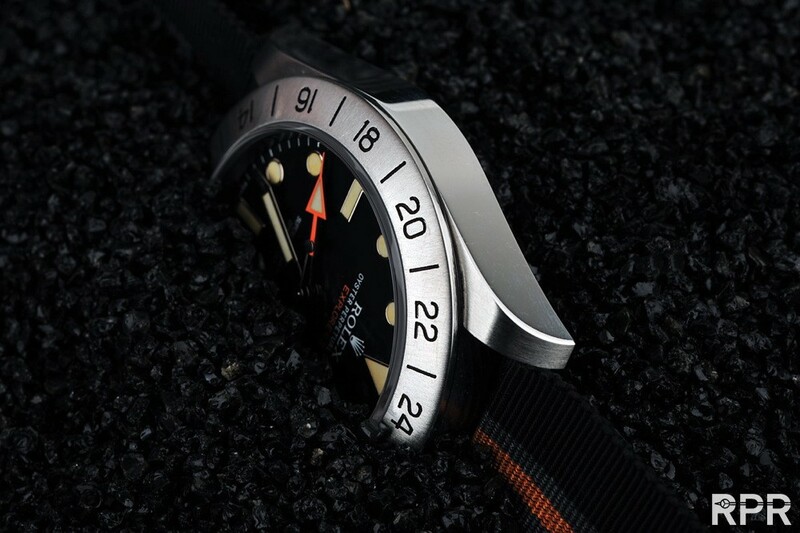 After the success of the Piccard Single Red Deepsea, there was only one logical next step, from the bottom of the sea to the highest point on earth. 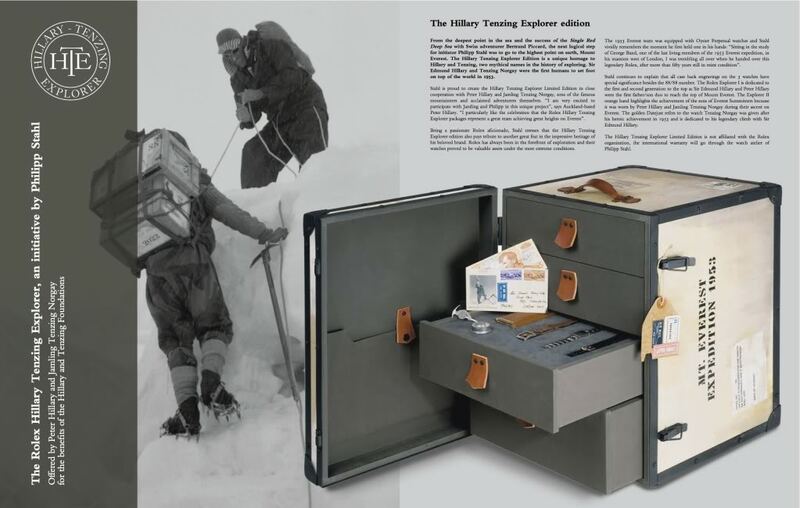 Logistically, it was a bit harder to organise as Hillary’s son Peter lived in Auckland, New Zealand and Tenzing’s son Jamling resided in Darjeeling, India. As gifted adventurers, Peter and Jamling spend most of their time leading groups on mountain treks in the Himalayas as a livelihood. 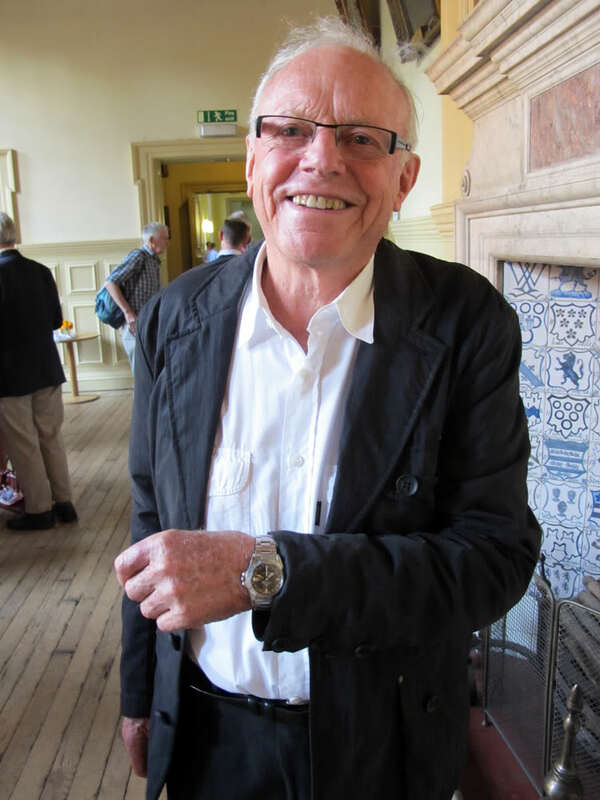 It so happened that Jamling would be heading to Europe for a lecture at the Explorer’s festival in Poland, a golden opportunity for me to meet him. 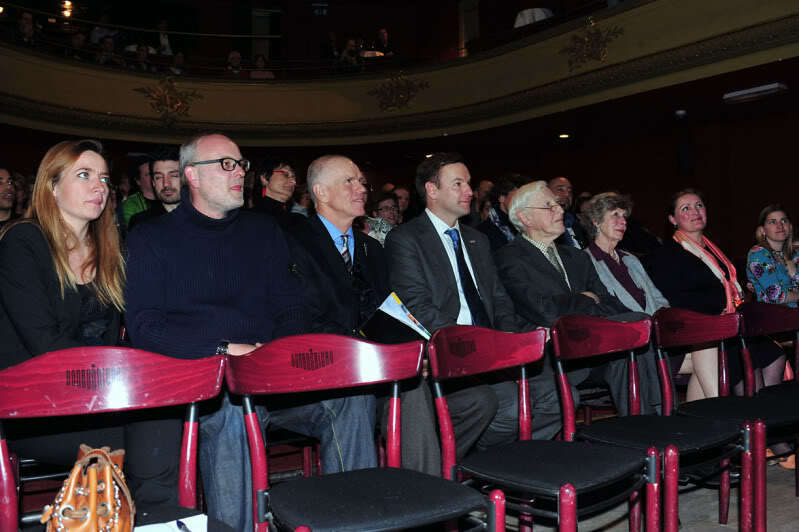 I flew to Warsaw and got a rental car to drive out to Lodz, a 3-hour drive from the capital. 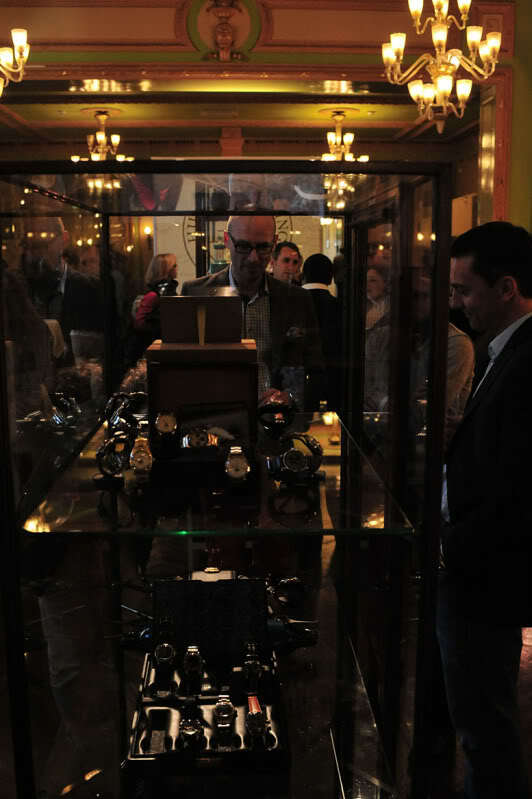 Being used to the exclusive environments in which watches are normally presented and traded, the trip felt like going back into time. 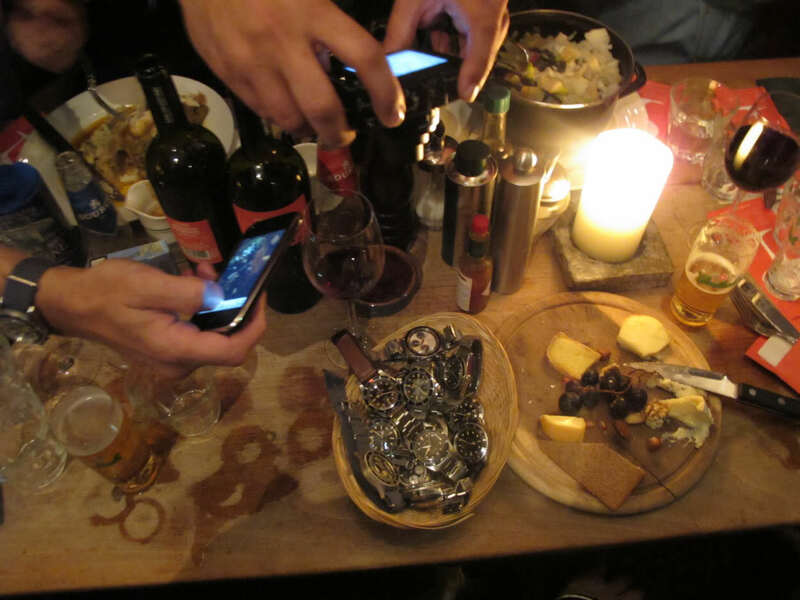 I met Jamling in the bar of our hotel: a dilapidated concrete block poorly lit with fluorescent lamps and grumpy women behind the reception counter refusing to speak any other language than Polish. For some reason, I had expected a devout Buddhist Tibetan, but after a few pints of Tyskie beer the atmosphere was exuberant. 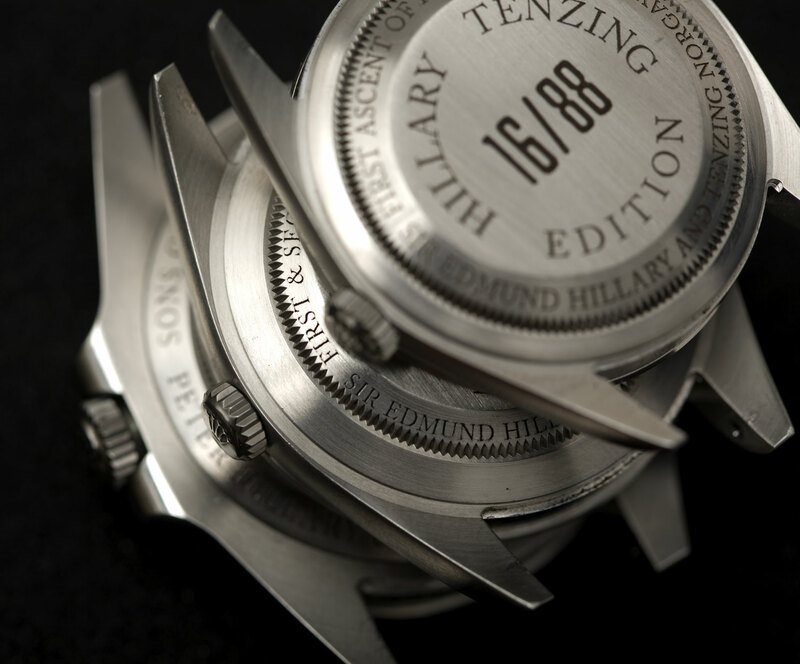 Back from Poland, I started working on a special Hillary Tenzing edition, based on the Explorer model, arguably the ultimate Rolex sports watch. 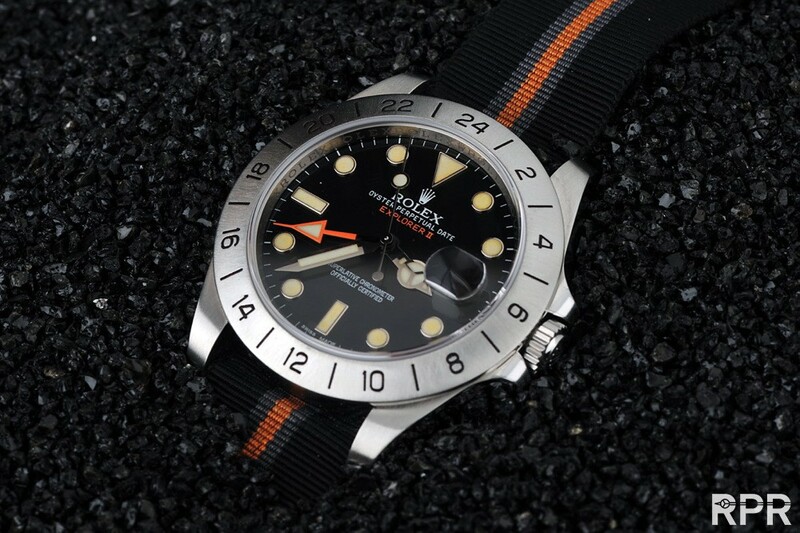 The Explorer prototype had proven its reliability during the earlier Himalayan expeditions, with the first successful ascent of Mount Everest by Sir Edmund Hillary and Tenzing Norgay in 1953 as climax. 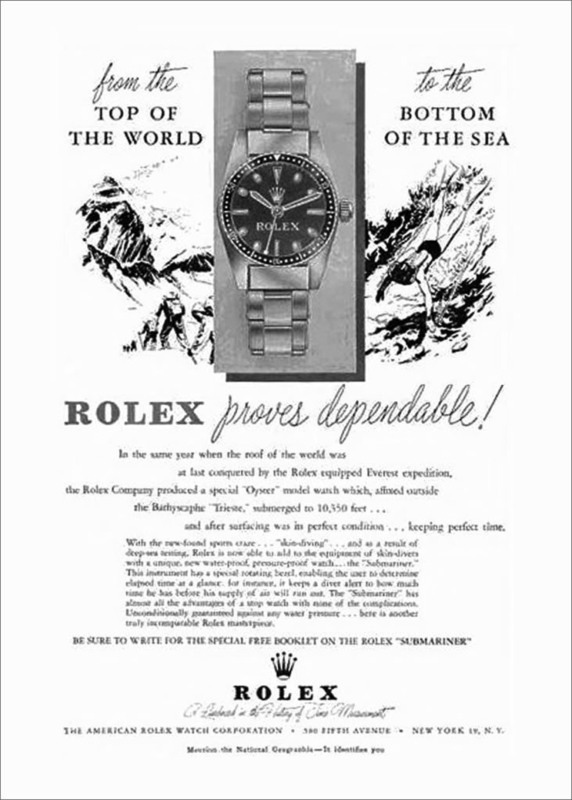 Although it will always remain a mystery if Rolex was literally on the summit, the Oyster Perpetual models were an essential part of the equipment back then. 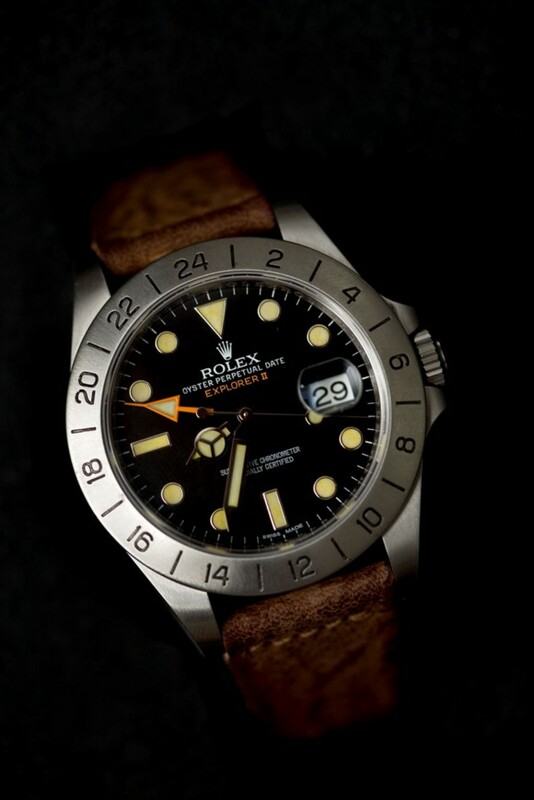 I visited George Band, one of the last living 1953 Everest expedition members at his mansion outside London, and was finally able to hold one of these legendary Everest Rolex. 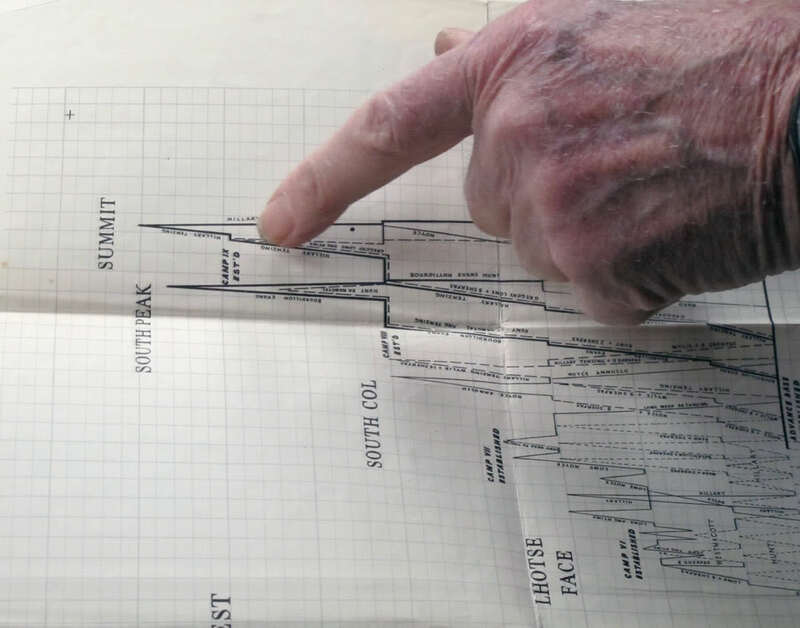 At home with George Band, just outside of London..
George Band was truly amazed that a young guy like me showed so much interest in the famous Everest expedition. 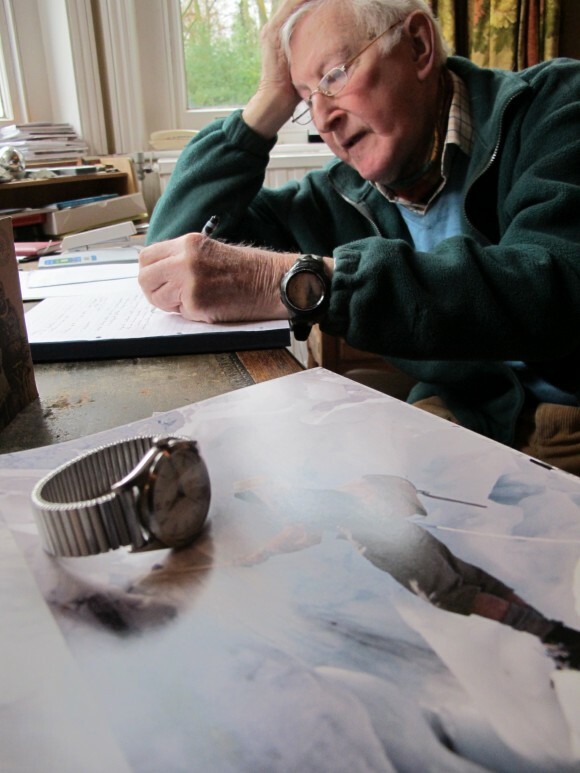 His wife Susan had graciously allowed me to meet him for an hour, looking at the fragile state George was in. 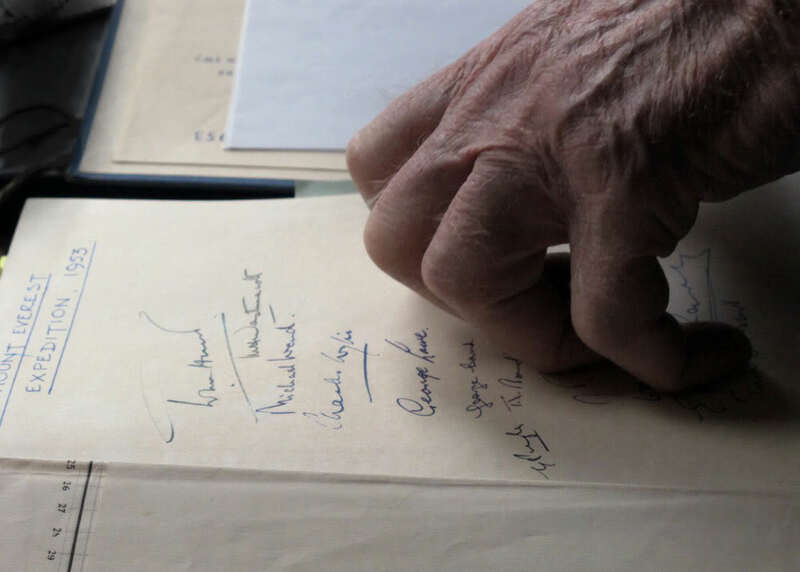 When he started talking about his Everest and Kanchenjunga expeditions in his library filled with mountaineering books, he just couldn’t stop. Fantastic anecdotes and emotional moments filled the 4-hour visit, until Susan urged me to leave again. 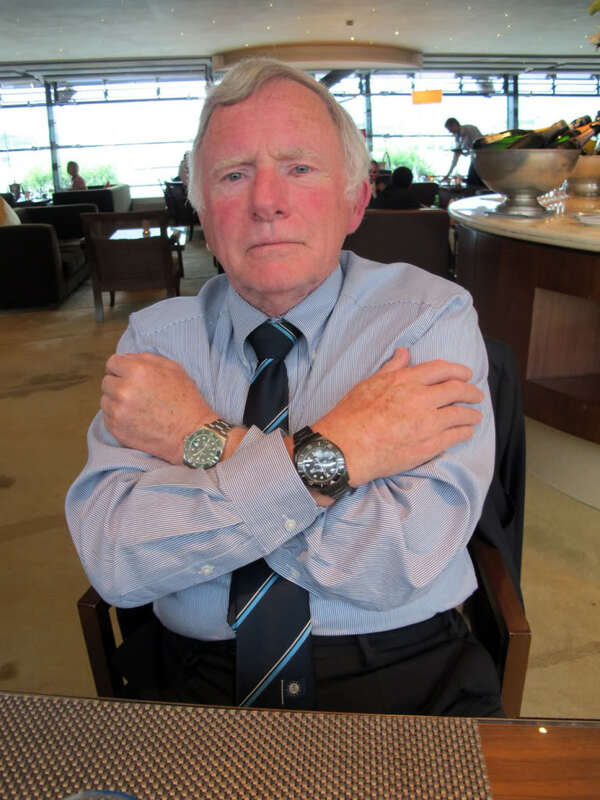 On my way out, I explained a baffled George the true value of his Rolex expedition watches. He was planning on bringing them to the local jeweler for service, nut luckily I was just in time to stop him. 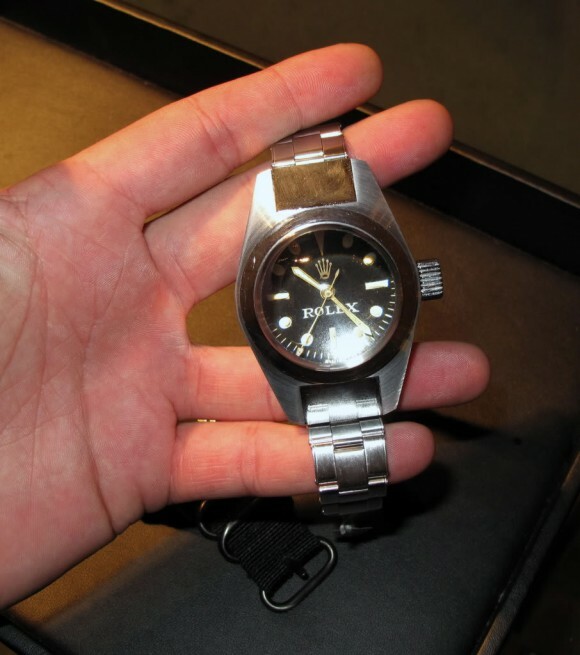 Any Rolex watch will have greater value if it is still in original condition, specially his! The all original 1953 Everest George Band Rolex on the left & on the right, George Bands also still all original, Rolex Explorer Precision he wore during his 1955 first ascent to Kangchenjunga! 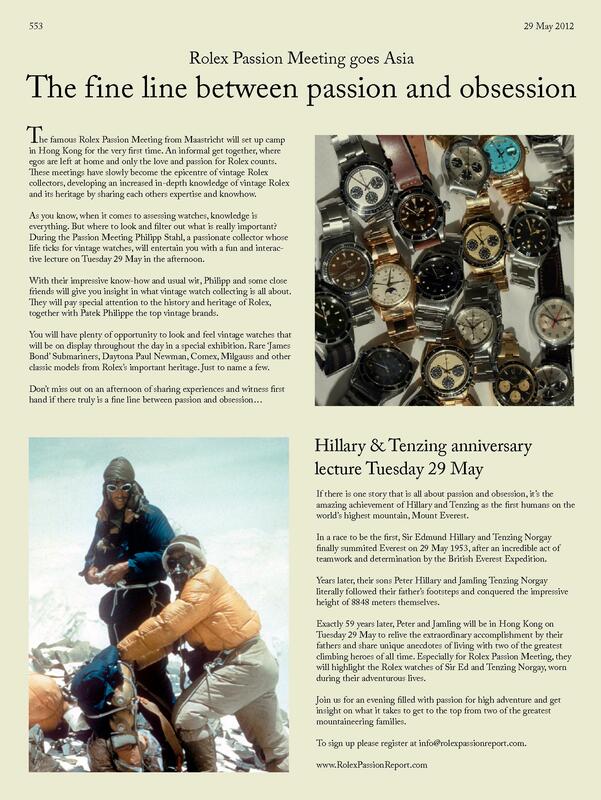 I have travelled thousands of miles and spent countless hours on research to create to appropriate experience and emotion with the Hillary Tenzing and Rolex homage. 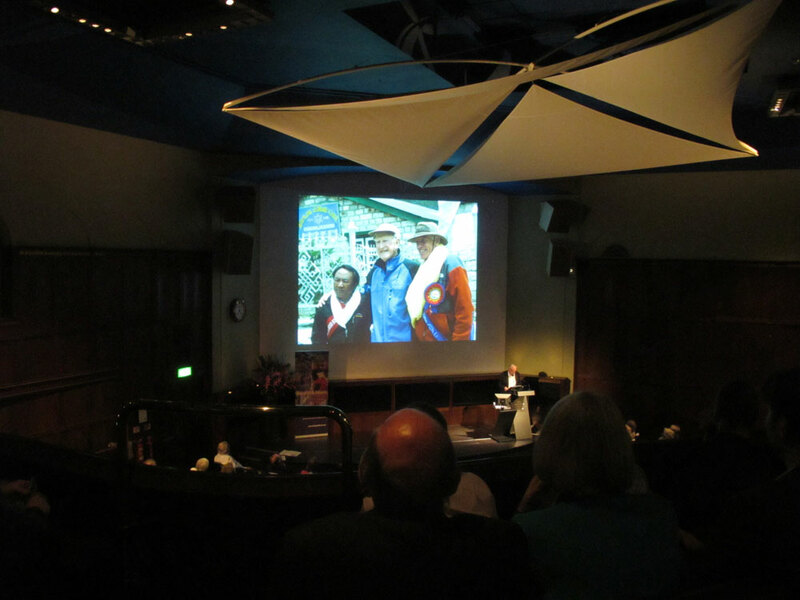 At the Royal Geographical Society in London, for example, I was allowed to dig into their huge archive on Everest, wearing white gloves to protect the valuable papers. 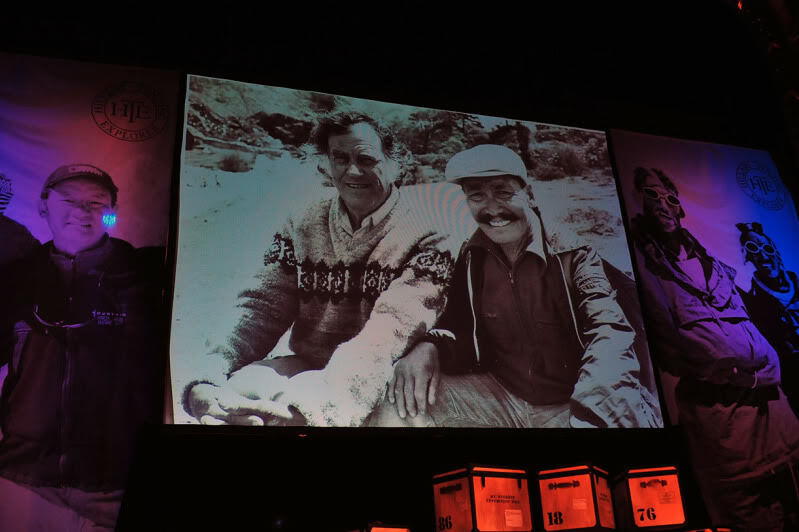 In terms of encounters, two highlights really stood out and still make me smile thinking back at them. In Wales, I went to the birthplace of British mountaineering, the awesome Snowdonia National Park. 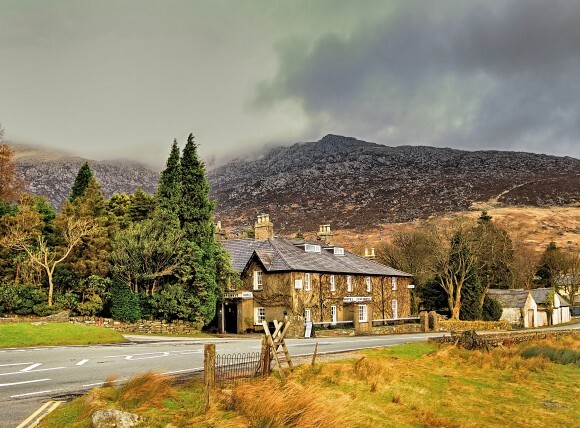 I slept in the legendary Pen-Y-Grwyd hotel, close to Mount Snowdon, where the 1953 Everest members held their regular reunions. The hotel is highly recommended, unless you cannot do without mobile coverage, WiFi, television and other luxury that is standard nowadays in most hotels. 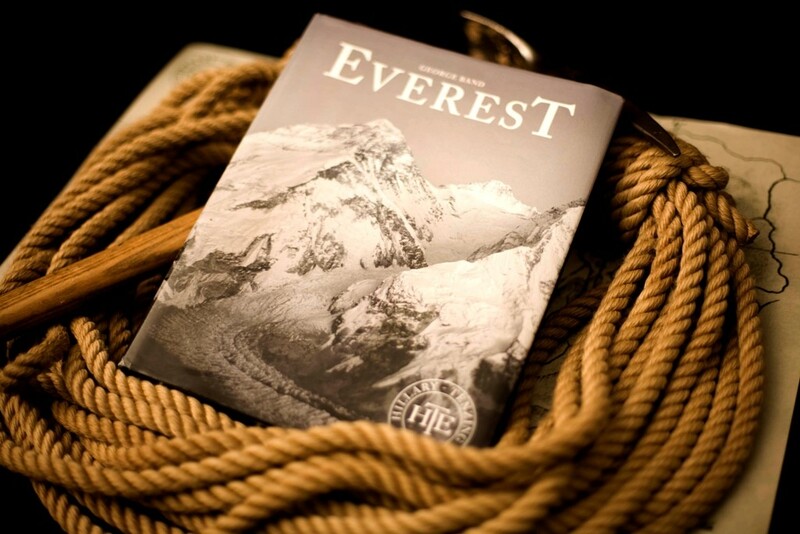 Nostalgia in every nook and cranny, including a vintage Everest chime signaling the start of dinner. George Bands hand on original signatures off all members of ’53 Mt. Everest Expedition.. 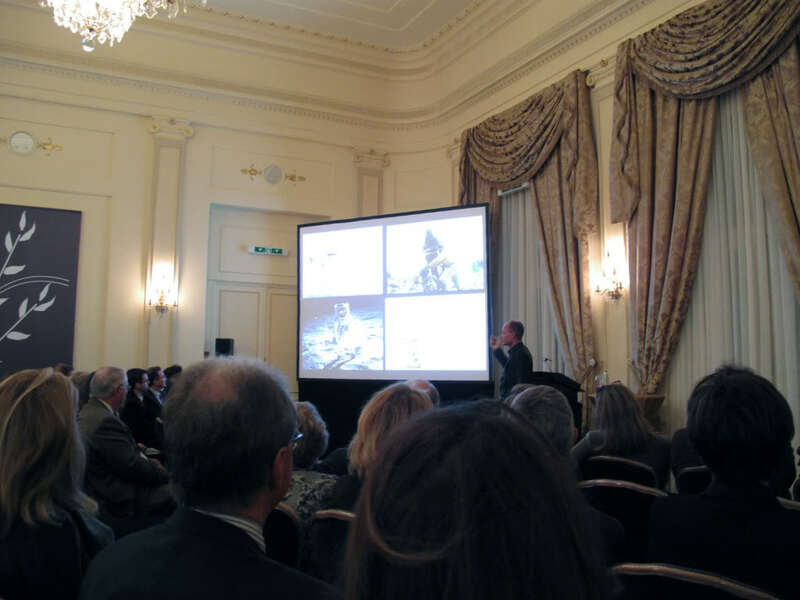 Pointing out the route of Sir Edmund Hillary and Sherpa Tenzing Norgay made..
Mike Gill, adventurist and close friend of Sir Edmund Hillary at RGS London with my Hillary Orange Hand. Everybody is happy now all Hillary Rolex are back and safe..
Happily AQ auctioneers worked out a deal with us so the whole Hillary Rolex collection could go back to NZ. 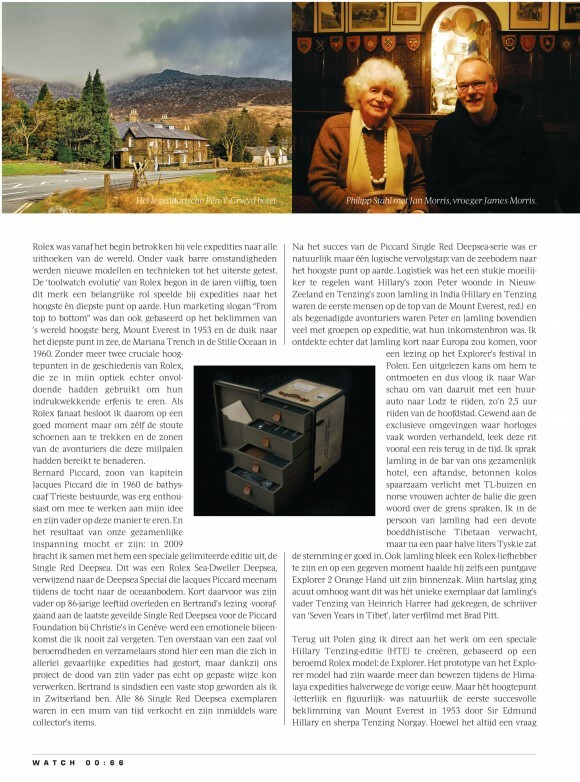 James became Jan after surgery in the seventies, and she is now a famous writer in Great Britain. Jan didn’t understand one bit about my passion for watches, but could still remember that she had lost her precious Timex in an Everest crevasse back in 1953. 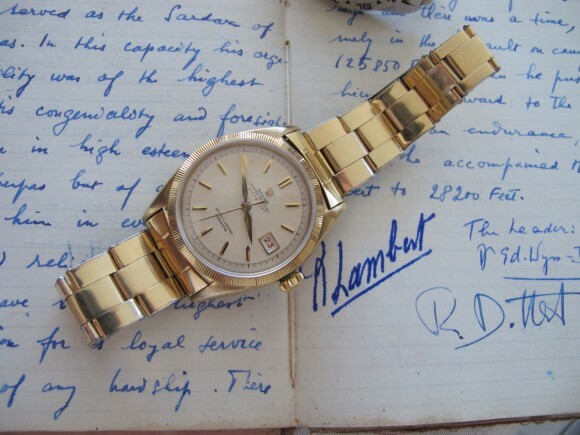 “Lucky it wasn’t a Rolex”, she added cheeky. 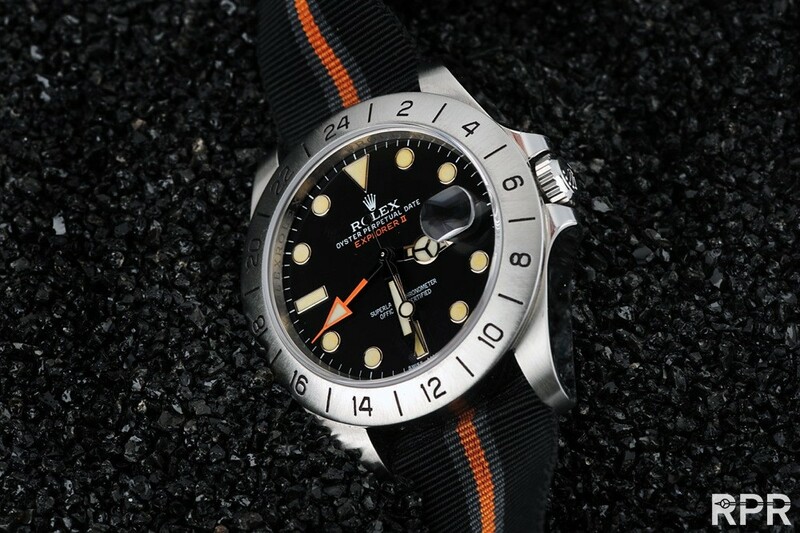 Truly a colorful character! 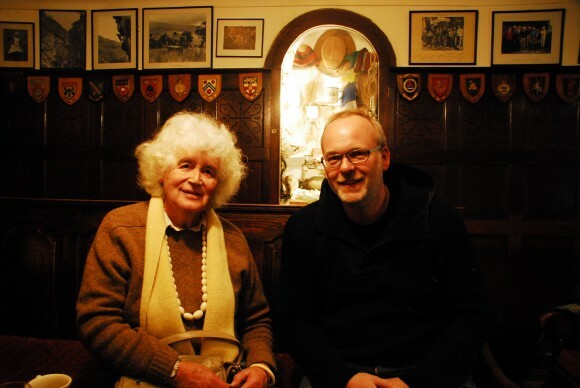 Jan Morris at Pen-Y-Grwyd hotel Wales.. Besides a personal highlight, the second story was also a scoop in the watch world. 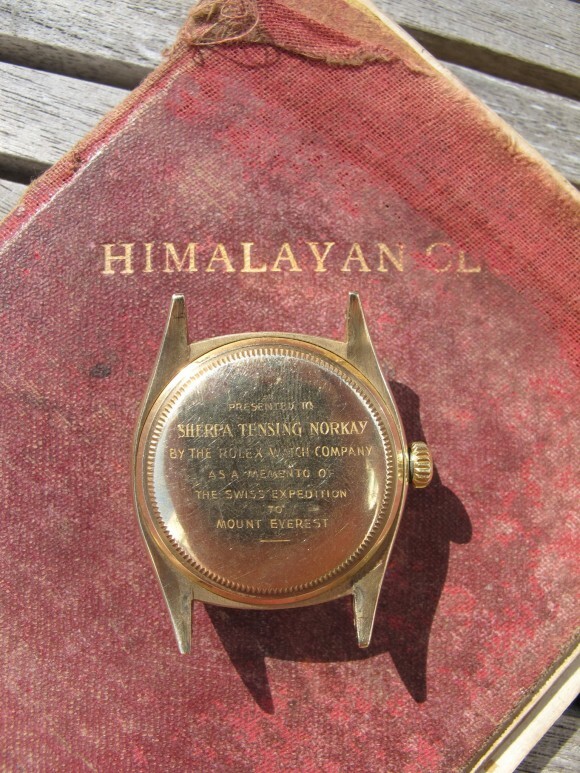 For the first time ever, I was able to show pictures of the golden Rolex Date Just that Tenzing Norgay was given by the Swiss expedition in 1952. 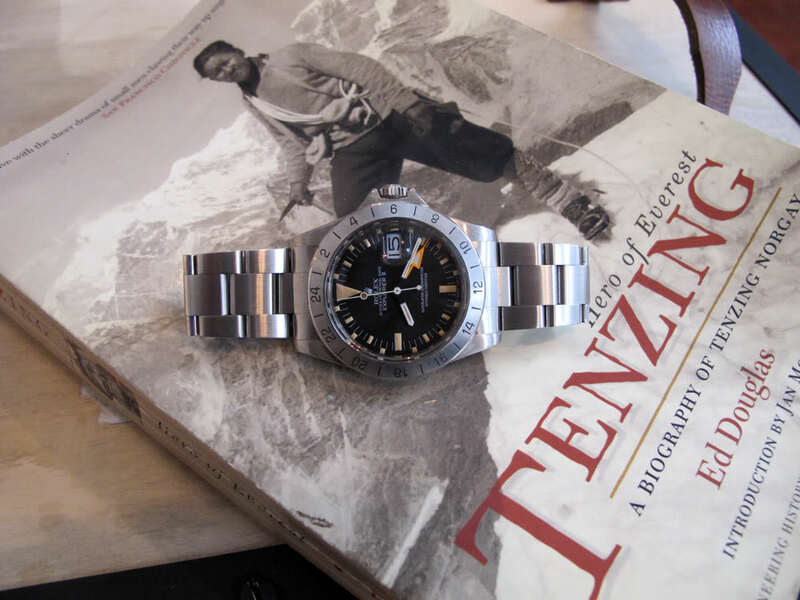 During that year, Tenzing climbed together with Swiss Raymond Lambert until a few hundred meters before the Everest summit, when their oxygen equipment failed. 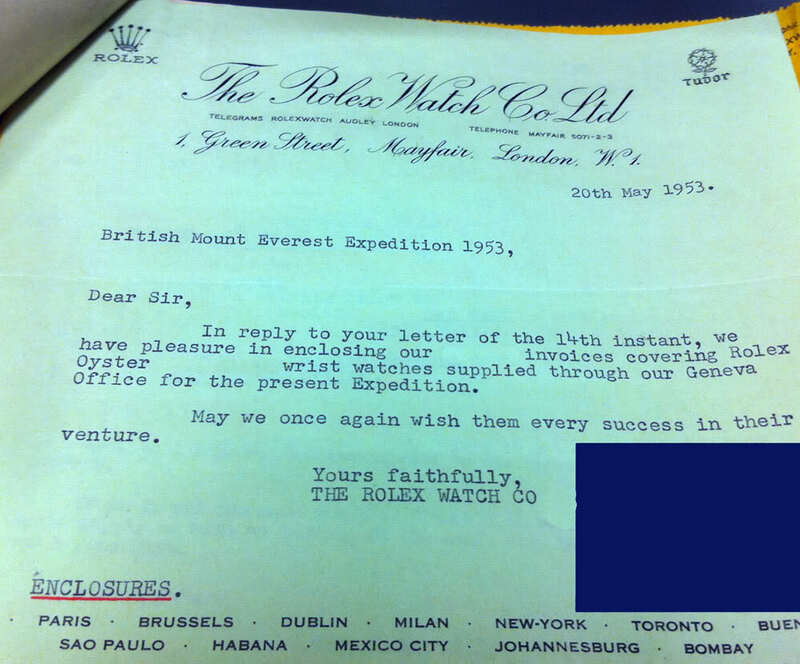 To continue would mean a certain death, and disappointed they returned to base camp, knowing the next chance for summiting Everest would be the British in 1953. 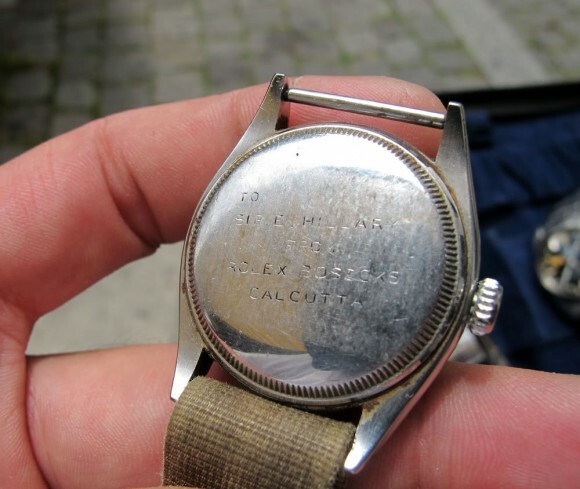 Tenzing and Lambert became close friends and as memento for Tenzing’s efforts for the Swiss, they gave him a golden Rolex with unique inscription. 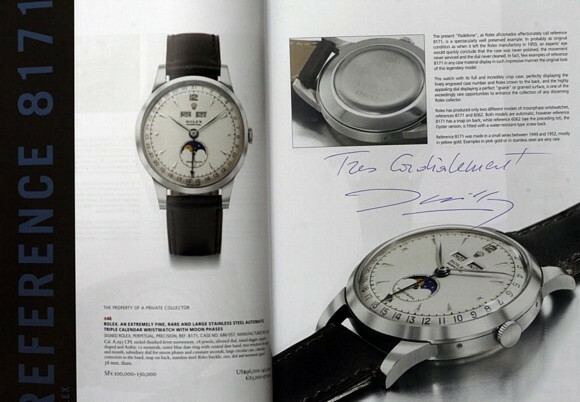 Tenzing gave this precious watch to his son Norbu before he died. While visiting him in San Francisco, Norbu told me he had stuffed the watch for years in his television to cover a gap, not knowing its true value! 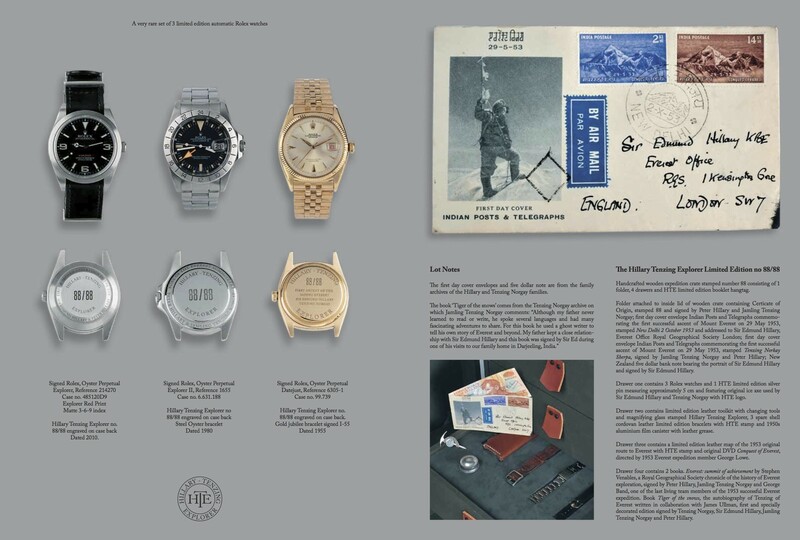 The Hillary Tenzing Explorer set of 3 heritated Rolex, No.88/88 got sold for $ 105.000,- at Christie’s Geneva for the Hillary & Tenzing Foundations! HTE 88/88 specially added Hillary Tenzing Explorer laser engraved case back gravure. 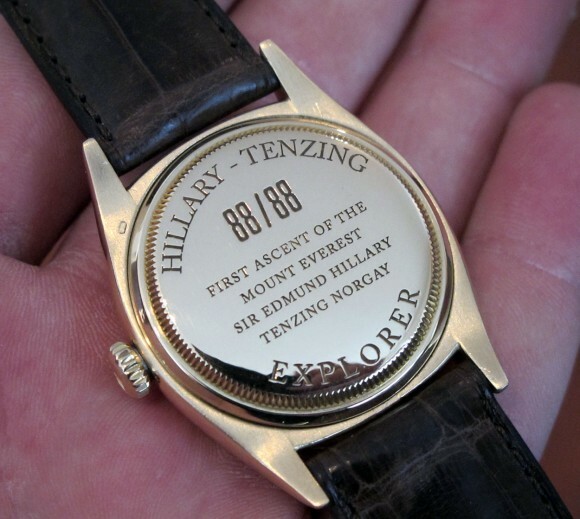 All these encounters and experiences have contributed to an impressive Hillary Tenzing Edition (HTE) package, consisting of parts from all parts of the globe. 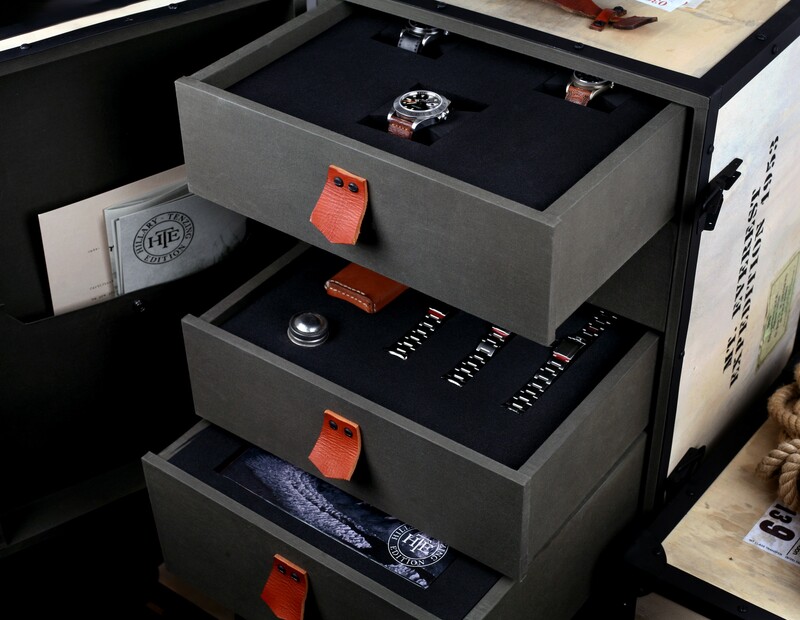 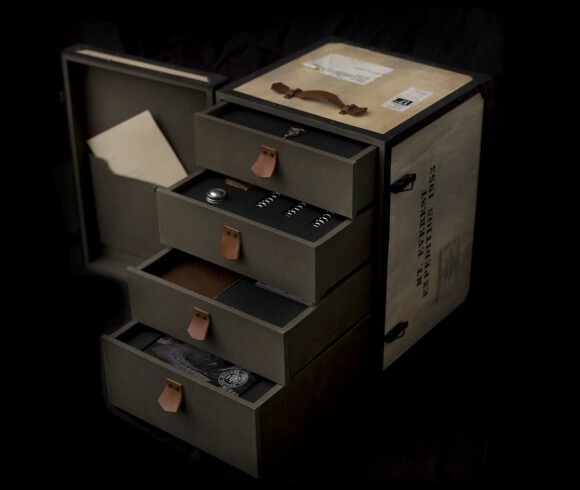 The expedition crate is similar to the one used in 1953 and is handmade in Spain. Eye-catcher in the HTE package are 3 Rolex Explorer watches with the unique HTE look-and-feel to represent the unrivalled history of Rolex in exploring the world’s final frontiers. 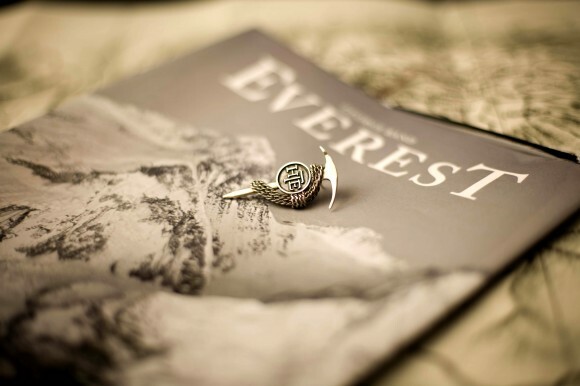 The crate’s four drawers contain several custom-made vintage items commemorating the 1953 Everest expedition, like a sterling silver alpine pin, a special edition of the book Everest by the late George Band and a leather bound of the original 1953 Everest route. 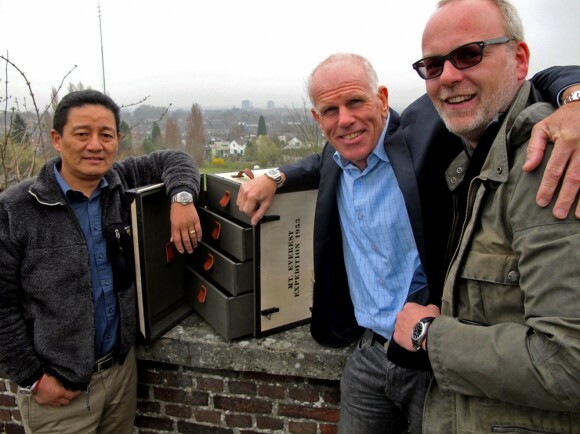 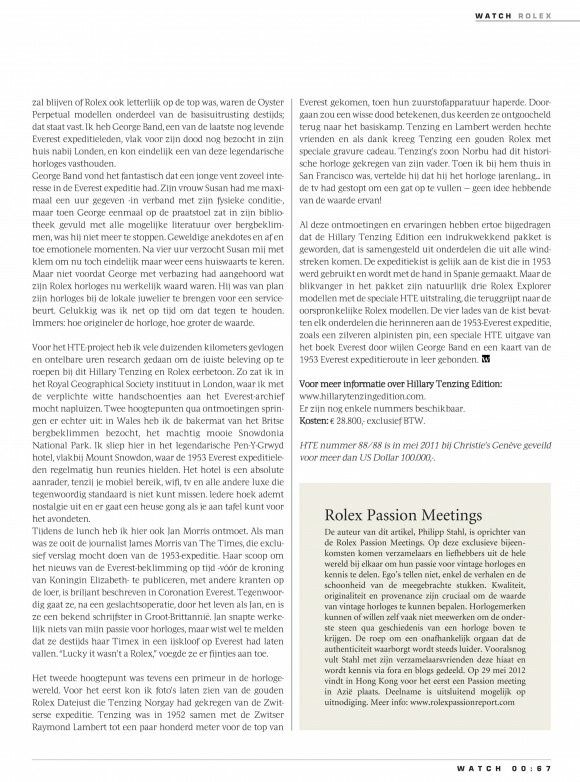 HTE Expedition crate..
First Hillary and Tenzing Edition Meeting in Maasticht, The Netherlands…. 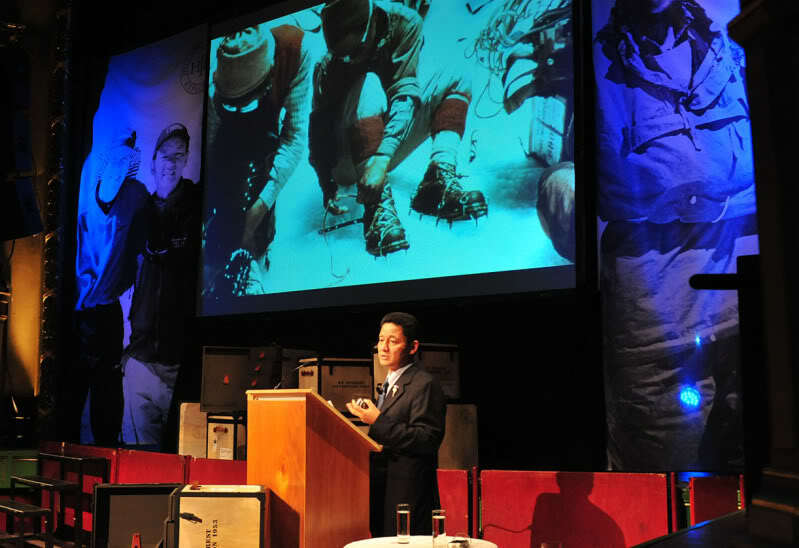 Jamling Tenzing Norgay, for once in elegant costume and proud of wearing his silver HTE pin just before his speech..
What a exceptional moment, in my hometown Maastricht, 2 Rolex Hero’s talk about their passion..
Sir Edmund Hillary & Tenzing Norgay..
HTE and Passion Meeting in M In May 2011, HTE number 88/88 has been auctioned for the Hillary and Tenzing family foundations at Christie’s Geneva for over USD 100,000. Peter Hillary and Jamling Tenzing Norgay at Christie’s Geneva. 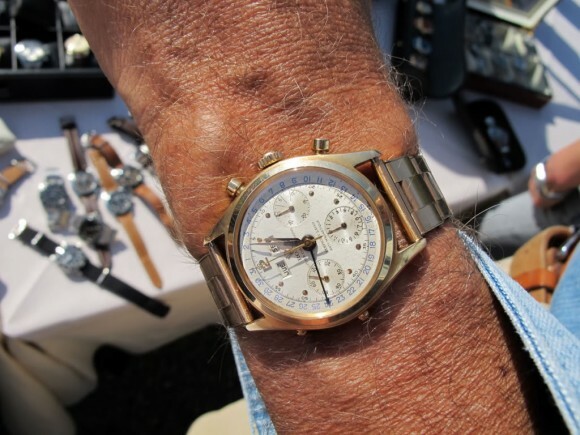 Rolex oldest member of the Board, the legendary Jean Claude Killy ( http://en.wikipedia.org/wiki/Jean-Claude_Killy) vivid vintage Rolex collector with a very prestine eye for detail I normally meet my hero at the watch auctions in Geneva, where Mr. Killy is always at front seated of the auction room, hunting stunners from Rolex their enormous Heritage…Great Rolex ambassador and super cool!! 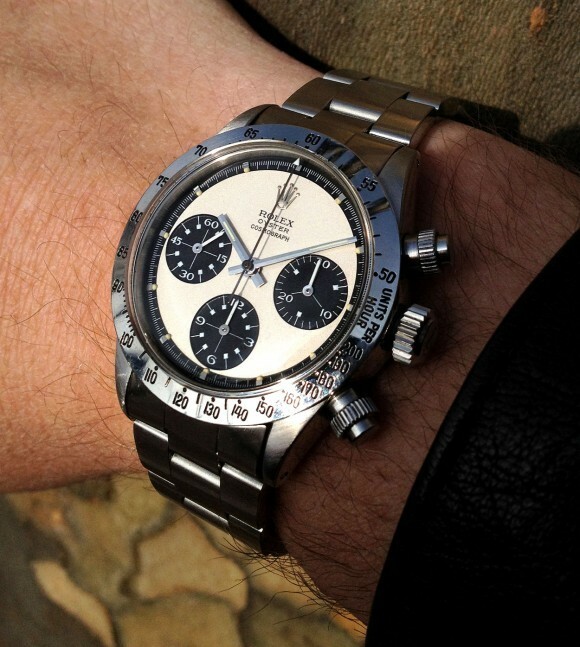 This exceptional Rolex ref 8171 Padelone in NOS ( New Old Stock) condition is secured for the future.. 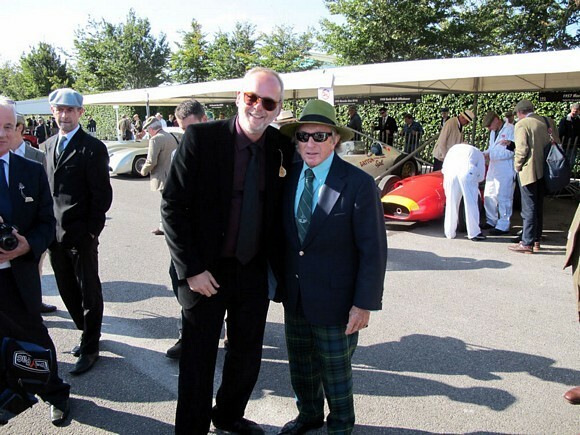 Encounter at Rolex sponsored Goodwood races with another Rolex Legend, Sir Jackie Stewart..
About the author Philipp Stahl is together with his good friend Bernhard B. founder (http://100percent-rolex.blogspot.com/) of the Rolex Passion Meetings, informal get togethers at locations with matching historical backdrop, where egos are left at home and only the love and passion for Rolex counts. 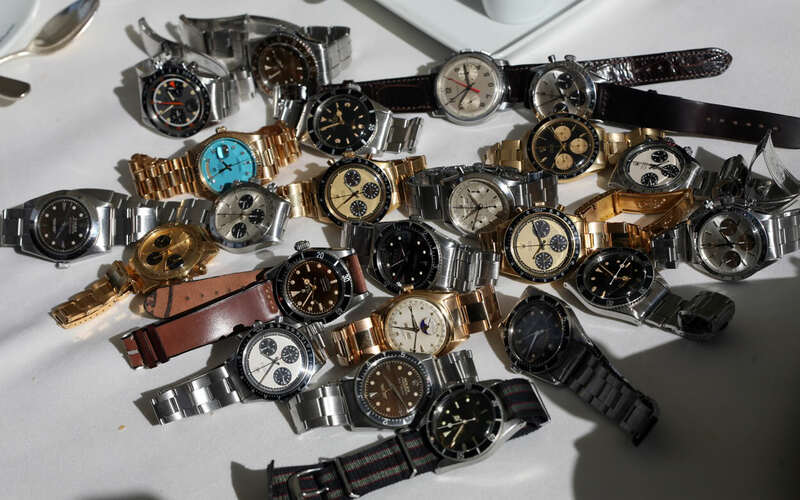 These meetings have slowly become the epicentre of vintage Rolex collectors, developing an increased in-depth knowledge of vintage Rolex and its heritage by sharing each others expertise and knowhow. 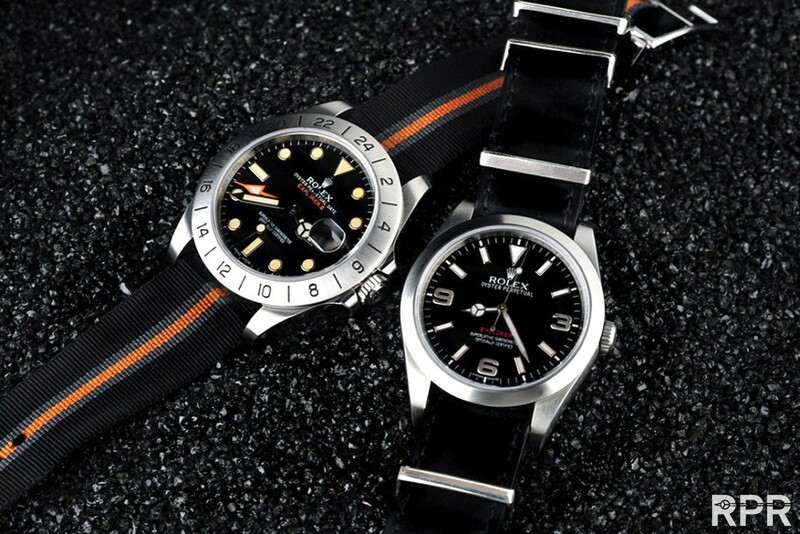 Ref 6062 Steline & ref 6036 Killy..
Quality, authenticity and provenance are crucial for valuing vintage watches. 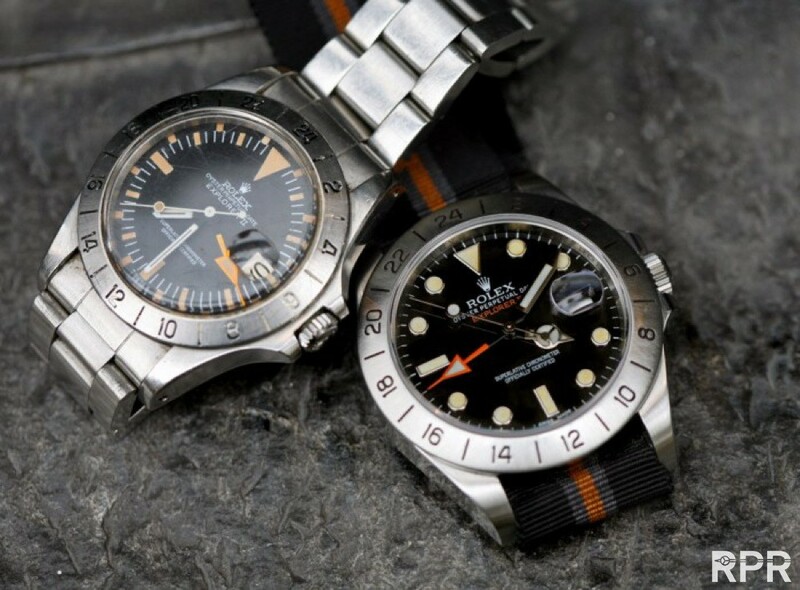 Watch brands can or will not cooperate to reconstruct the history of watches and thus their true value. 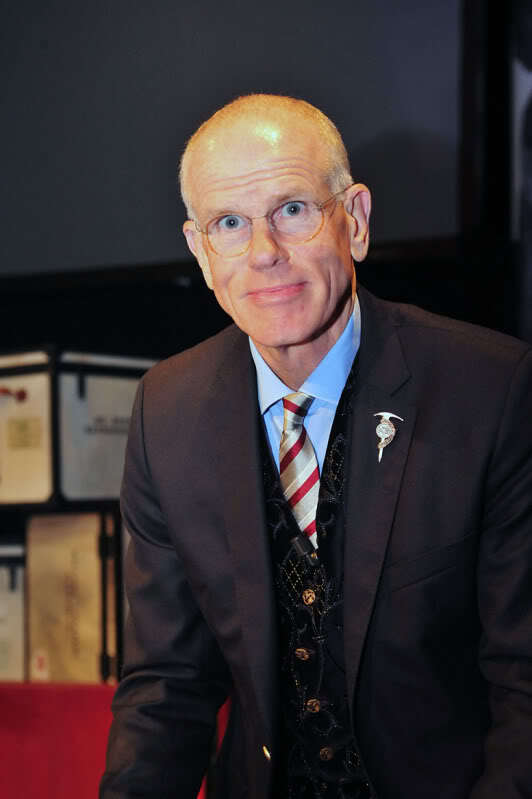 The call for an independent institute that guarantees authenticity gets louder. Stahl and his collector friends provisionally step up to fill this void by sharing their knowledge on meetings and through fora and blogs. This post was written by Philipp on April 24, 2012.